Best known for its waterfalls, dramatic canyon vistas and vibrant displays of fall foliage, New York's Letchworth State Park ("The Grand Canyon of the East") stands out among the Northeast's most spectacular parks. 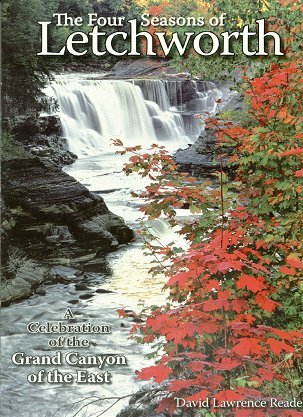 The Four Seasons of Letchworth is a celebration of the nature and beauty of New York's Letchworth State Park. "The air is especially sweet here this time of year, the fragrant breezes cross-pollinated with the scents of various flowers, evergreens and deep forest. Ahhh, nature, the great air freshenerand theres certainly no lack of things natural here. "Speaking of nature, green would be the color of the season. With lots of lush forest and expansive lawn, green dominates. Even on the sheer cliffs around the waterfalls, luxuriant mats of green mosses thicken and spread all season long, kept moist by natures own powerful sprinklers. "We can look to the sky for contrast to the green for it is often deep blue during the summertime. If you stand at the right angle to the sun, you can even see the sky reflected in the water, adding color at ground level. Mornings and evenings you can enjoy man-made colors, as brightly colored orbs take off skyward from the balloon launch area." This lavish book contains more than 100 full-color photographs (including numerous two-page spreads) along with a perfect blend of personal stories, insights and glimpses into the history of the Park. Renowned photographer and author David Lawrence Reade celebrates the year-round splendor with his stunning images and reverent prose.